When breath becomes air, being mortal and your life in my hands 3 books collection set. Description: When Breath Becomes Air At the age of thirty-six, on the verge of completing a decade’s training as a neurosurgeon, Paul Kalanithi was diagnosed with inoperable lung cancer. One day he was a doctor treating the dying, the next he was a patient struggling to live. When Breat When breath becomes air, being mortal and your life in my hands 3 books collection set. Description: When Breath Becomes Air At the age of thirty-six, on the verge of completing a decade’s training as a neurosurgeon, Paul Kalanithi was diagnosed with inoperable lung cancer. One day he was a doctor treating the dying, the next he was a patient struggling to live. When Breath Becomes Air chronicles Kalanithi’s transformation from a medical student asking what makes a virtuous and meaningful life into a neurosurgeon working in the core of human identity. Being Mortal: Illness, Medicine and What Matters in the End For most of human history, death was a common, ever-present possibility. It didn't matter whether you were five or fifty - every day was a roll of the dice. But now, as medical advances push the boundaries of survival further each year, we have become increasingly detached from the reality of being mortal. So here is a book about the modern experience of mortality - about what it's like to get old and die, how medicine has changed this and how it hasn't, where our ideas about death have gone wrong. 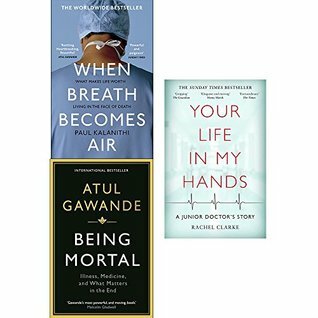 With his trademark mix of perceptiveness and sensitivity, Atul Gawande outlines a story that crosses the globe, as he examines his experiences as a surgeon and those of his patients and family, and learns to accept the limits of what he can do. Your Life In My Hands: A Junior Doctor's Story In Your Life in My Hands, television journalist turned junior doctor Rachel Clarke captures the extraordinary realities of life on the NHS frontline. During last year's historic junior doctor strikes, Rachel was at the forefront of the campaign against the government's imposed contract upon young doctors. Her heartfelt, deeply personal account of life as a junior doctor in today's NHS is both a powerful polemic on the degradation of Britain's most vital public institution and a love letter of optimism and hope to that same health service.